Please take a few moments to ponder about the precariousness of one's life. If it calms you down and paralyzes you, let it, it is the least we can do to honor the suffering of fellow humans. It could be you, me or any one. Societies evolve not just to safeguard the fittest, but to protect the ones in their most vulnerable moments. No matter how rich, arrogant, humble you are, on the ground in the floods your stretched hand is no different than the other seeking help. 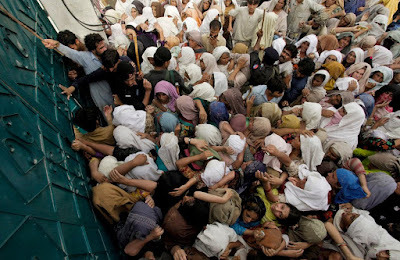 The first picture is devastating, where hundreds are trying to get a bite of food to survive. In the second picture the little girl is holding a plastic bag, that is all left there to get soup to eat... there is an expression of love, of caring the ones who cannot help themselves by the ones who can. There is goodness built in each one of us to risk our safety to protect others. May God give us the thought to sacrifice some of our convenience to the help the ones needing it so desperately?